I’m starting to understand why all the serious aerobatics pilots live in Arizona or Florida. You’d think Southern California would be sunny and clear as often as either of those states. It ain’t necessarily so. But at least I’m getting some adventure out of waiting for El Nino, La Nina, Old Man Winter, Old Man River, or whatever they call this to pass. I’ve been waiting about two months to get my phase check done, and I keep getting weathered out. And of course, all I need is one more flight. This checkout will give me the ability to fly the Decathalon in contests, fly aerobatics with passengers, and to legally fly any tail-wheel aircraft weighing less than 12,500 pounds. One typically doesn’t fly aerobatic planes in the clouds, because the thing that makes them so good at aerobatics is their extreme unstability–they don’t want to fly straight and level. In some of them, you let go of the stick and two seconds later you’re in a 40 degree banked dive toward the ground. 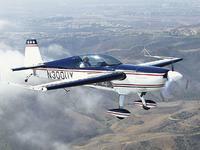 Aerobatic aircraft are also sparsely equipped, and are often not legal to fly at night or in bad weather. So when I was greeted this morning by a smarmy overcast cloud layer at about 3,000 feet, I knew this would not be the day. It’s not that you can’t fly the plane in weather like that–it’s that you can’t do any aerobatics in it (I typically use a block of airspace from about 2,000 to 5,000 feet above ground). But when I called Sunrise Aviation to cancel my flight with Tim, he had a modest proposal for me: the weather was closing in, and he needed to get the Pitts S2-B (an advanced level aerobatic bi-plane) out to Borrego Springs for the competition this weekend. Weather-wise, it was now or never. Problem is, he’d need a ride back after dropping off the plane. Borrego Springs is about three hours by car, but less than an hour by plane. So what if I followed him out in my plane? Was I interested? I looked outside. I wouldn’t fly in weather like this. It’s called “scud running”–flying underneath a low layer of clouds, often in poor visibility. There was a time when scud-running was common place, but with the advent of instrument flight that has changed. When the weather gets bad, you’re supposed to fly on instruments. Many an accident has happened because pilots continued visual flight into instrument conditions. So obviously I should err on the side of caution and stay on the ground. Thirty minutes later I’m sitting on the wing of the Cherokee. She’s preflighted and ready to fly, when the shiny red Pitts Special makes a perfect 3-point landing and taxis down the ramp. Tim’s student joins me in the Cherokee, and we’re off. The flight to Borrego, a tiny airport in the desert 50 miles south of Palm Springs, was actually quite uneventful. The clouds through the Banning Pass were a bit low for my comfort level, and some heavy turbulence was experienced over Palm Springs. But once we came through the pass, the clouds completely disappeared. Fifty miles visibility and pure blue sky all around. In truth, the trip wasn’t really dangerous for me at all. The Pitts is faster than my Cherokee, so Tim was a good 20 miles in front the whole way, reporting the weather periodically on the radio. Borrego was a trip! I’ve never seen so many expensive Pitts aircraft all in one place. One guy had a two month old Pitts S2-C with all the bells and whistles, about $250,000. I watched someone practicing in Sunrise’s Extra 300, arguably the finest aerobatic aircraft in the world. Those pilots, they’re a different breed out there. Right before we left, I watched a Learjet take off, fly low over the runway while raising his gear, and then climb to near vertical and pull into a hard 90 degree left bank, engines screaming all the while. Frustrated airshow pilot, perhaps? The plane I most often fly, Decathlon 5535K, was out at Borrego. It has a beautiful red, white and blue paint scheme which seems to turn heads wherever it goes, even just sitting on the ramp. Anyway, whoever was flying it lost control on landing and scraped a wingtip on the ground. The winds out in the desert can be quite strong. I inspected the damage, which didn’t look too terribly bad, though Tim said it had hit the runway with enough force that the wing spar might have been cracked. So until it can be opened up and inspected, no aerobatics for that plane. On the return flight, Tim gave me his rules for scud-running, which include establishing your own personal minimums for visual flight in poor weather. We were always in legal VFR conditions, so no FAA regulations were broken. But the thing about visual flying is that you never know when it’s going to descend below those legal minimums. Sure, you get a full weather report from DUAT or a flight service station briefer, and we got updates from Flight Watch en route. But still, those are just forecasts. By the time we landed I was pretty trashed. Between monitoring the weather, watching for descending IFR and other VFR traffic, navigating, and turbulence it was time for a nap. But no such luck. We landed back at Corona around 5:30 p.m. which left barely enough time to drive home, shower and change clothes, drop Tim off at John Wayne Airport, and be at the Performing Arts Center for our 6:50 p.m. call time. So would I do the whole scud-running thing again? Probably not. Or at least, I’d have some slightly higher minimums for the weather. It was a great learning experience though, and now Sunrise owes me a favor. Tim said he’ll get me some Pitts time if he can. Giddy up. It’s sad to think that I could have been out at Borrego competing this weekend if only the weather hadn’t slowed down my training.